Austrian skydiver Felix Baumgartner sits in the Red Bull Stratos capsule after the space jump was called off on Oct. 9, 2012, in New Mexico. An Austrian daredevil's attempt to make the world's highest skydive, a jump that would send him falling faster than the speed of sound, was aborted today (Oct. 9) because of strong winds over his New Mexico staging ground. 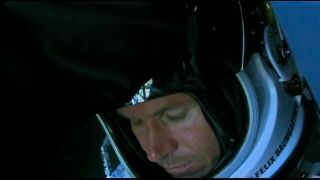 Felix Baumgartner was planning to leap from a balloon nearly 23 miles (37 kilometers) above Roswell, N.M., today (Oct. 9). But mission officials cancelled the liftoff at 1:42 p.m. EDT (1742 GMT) after winds began gusting at the launch site. It was the second time in two days that the record-breaking skydive was postponed by wind concerns. Weather is a major concern for the supersonic skydive attempt. The 55-story balloon that will carry Baumgartner aloft is extremely thin and fragile, and Baumgartner's team won't greenlight a launch if winds at or near the liftoff site exceed 2 mph (3.2 kph). "The weather tomorrow is not for certain," Red Bull Stratos' launch commentator said. "Somewhat questionable tomorrow, and then it begins to deteriorate for a couple of days. That's why they were trying so hard to get this off today." The balloon that was to be used today is now spent and cannot be used again, the commentator added. But Red Bull Stratos does have a backup balloon ready for the next attempt. When he does finally launch, if all goes according to plan, Baumgartner will plummet to Earth from an altitude of 120,000 feet (36,576 meters), becoming the first skydiver to break the sound barrier during his 5.5-minute freefall. He should also notch a few other records in the process, including longest-duration freefall and highest manned balloon flight, mission officials say. Red Bull Stratos officials have referred to Baumgartner's attempt as a jump from the edge of space, but this is perhaps a bit of an exaggeration. Space is generally considered to begin at an altitude of 62 miles (100 kilometers), or about 327,000 feet (though the U.S. Air Force awards astronaut wings to pilots who fly above 50 miles, or 80.5 km).